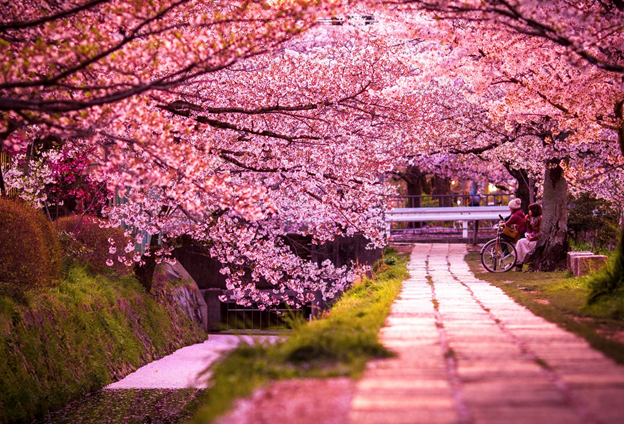 Japan is one of the well-known countries for viewing Cherry Blossom. 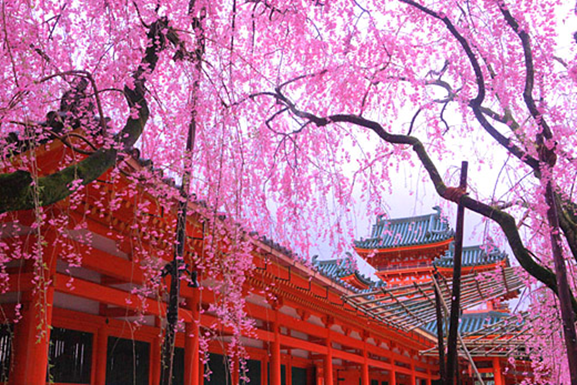 Many visitors purposely plan to visit Japan during spring season because of Sakura. Hanami or sakura viewing is usually starts in late March or early April every year. Each region has their own special events or hanami celebration. In Kansai region, there have many famous places covered by sakura. Today, let’s me introduce 10 best spots for viewing cherry blossom in Kansai region. Maruyama is the oldest park in Kyoto with more than 800 cherry blossom trees. The park is opened in 1886, which is a traditional Japanese park. It is one of the best spot of viewing cherry blossoms in early April. 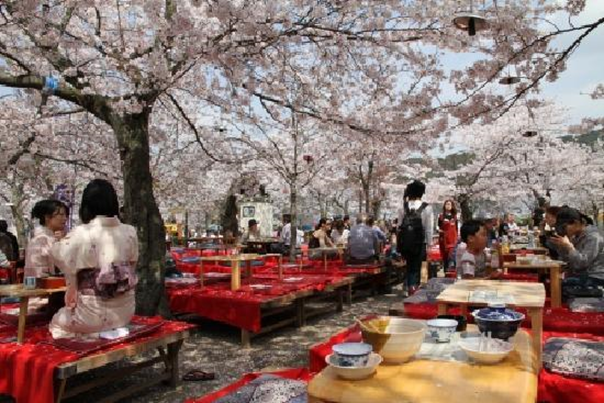 Many traditional street foods and temporarily constructed restaurants with tables under the sakura trees also available in the park. 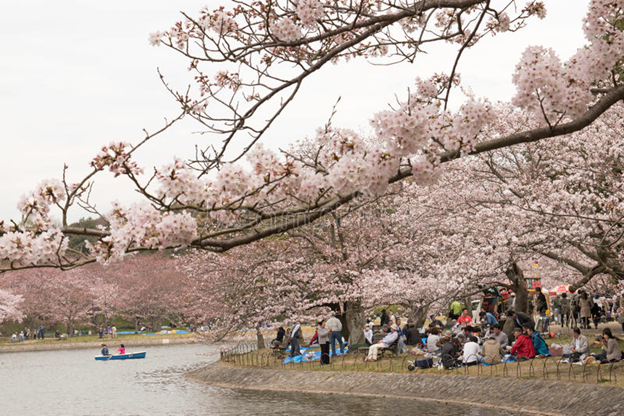 You can see many people picnic and enjoying the beautiful view of cherry blossoms. So, don’t miss out the famous shidarezakura (weeping cherry tree) or gion yozakura (Gion’s night viewing of cherry trees). The Philosopher's Path (Tetsugaku no michi in Japanese) is a streamside path through the northern part of Higashiyama district. The path is lined by hundreds of shrubs and trees. Every year in late March or early of April, many tourists visit this most popular hanami spot to take photos with hundreds of cherry blossoms during spring season. The path is between Ginkaku-ji temple and Nanzenji temple. Arashiyama is one of the wonderful place to escape from busy life. It is a place you can find popular temples and shrines, for example, Tenryu-ji Temple, Nonomiya Shrine, Daikaku-ji Temple and Togetsukyo Bridge. 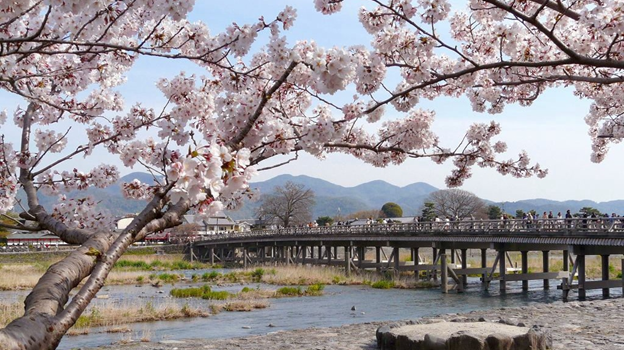 Togetsukyo Bridge is well known landmark in Arashiyama district for over four hundred years. This bridge has 155 meter over the Katsura River in Saga Arashiyama. During spring season, the mountain will turn into pink colors with cherry blossom trees. The trees are lightened with illumination that reflected in the river below the bridge. You can listen to the relaxing sound of the river and crossing an amazing bridge while enjoying how wonderful views and take a photo for memory. Heian Shrine is well-known Shinto shrines in Kyoto. It was built in 1895 on the 1,100th anniversary of the transfer of the capital from Nara to Kyoto. Behind the shrine’s main buildings, there have a large numbers of cherry trees stand in the garden. A night cherry blossom classical music concert is held in here also. This is the time for you enjoy the view of cherry blossoms and classical music. Next cherry blossom spot is Osaka Castle, a famous landmark and popular sightseeing spot in Osaka city. This tower is surrounded by citadels, turrets, gates and stone walls. After major repair works in 1997, Osaka Castle is now entirely modern on the inside and even has elevator for easier accessibility. The nearest park for viewing cherry blossom is Nishinomaru Garden, an important cultural asset by Osaka city. The place is famous as a cherry blossom viewing spot with 300 cherry trees and attracts many Japanese people and foreigners every year. The park is about 4.2 kilometers on the Miyakojima and Zohei-kyoku on the Kita side in Osaka. It is the place for viewing cherry blossom in early April every year. Nearly 5,000 sakura trees lining up the terrace of Okawa River and many visitors have a picnic along the riverside for enjoying sakura view. I like the park because of less crowded compared to other famous hamami spots in Kansai. When you plan to Nara, Nara Park is one of the must-visit attraction place. This is a famous tourist destination with World Heritage sites including Todaiji, Kasuga-taisha and kofukuji temple are located in its grounds. Nara Park has many wild animals such as squirrels and deer are running around the park. 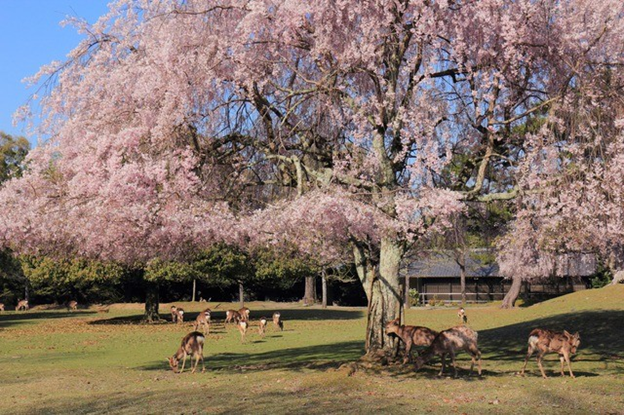 Every year in late March or early April, the park has crowded due to many visitors come to Nara Park for viewing 1,700 cherry trees of different varieties including Yoshino cherry, Narakokonoe cherry, Higan cherry,weeping cherry, Satozakura cherry and Yamazakura mountain cherry. You can play with the animals while enjoying the view of cherry blossoms. Access : 1) 5-minute walk from Kintetsu Nara station. 2) 10-minute walk from JR Nara station. Koriyama Castle is located at Yamatokoriyama city, where is in the northern are of Nara Prefecture. 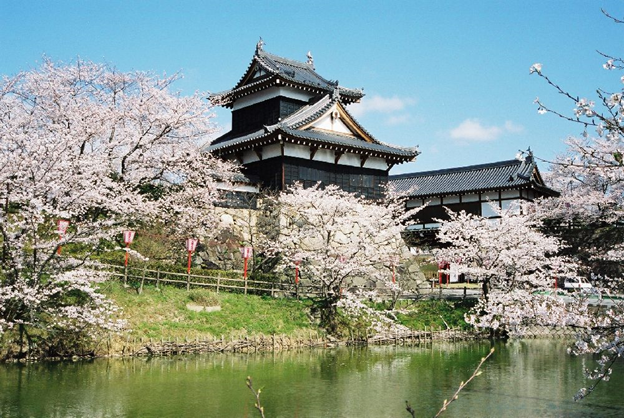 The castle is built in 1580 and one of the best spot of viewing cherry blossom for more than 400 years in Nara. About more than 1,000 sakura trees across the castle. Every year from late March to early April, Yamatokoriyama Castle festival is held in the place and many visitors come to join the events and enjoy cherry trees. Access : 1) 7-minute walk from Kintetsu Koriyama station on Kintetsu Kashihara line. 2) 5-minute walk from Koriyama station on JR Yamatoji line. 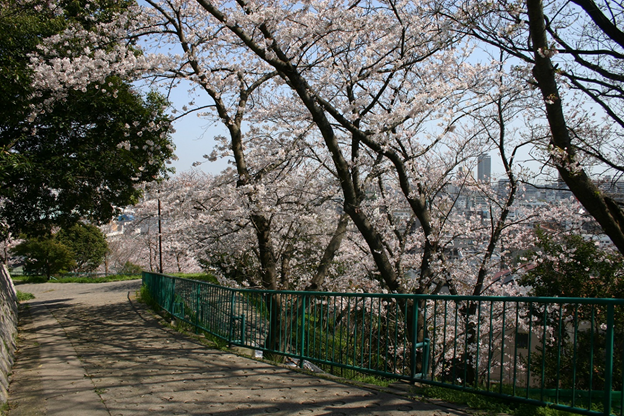 The park is standing 85 meters above sea level with 1,400 sakura trees in Kobe. This park has 1 kilometer walking path and very popular among locals for playing, jogging and relaxing in the park. During spring season, the park has covered by pink colors and many locals and foreigners come to enjoy sakura hanami with pretty skyline and sea sight. The last best spot of viewing cherry blossom is Sumaura Park. It is located on the hill of mount Hachibuse where you can take cable car to reach the park in just 3-minute ride. The park continues upward to the top of the mountain where another small amusement park. You may find a good view of Akashi Bridge. 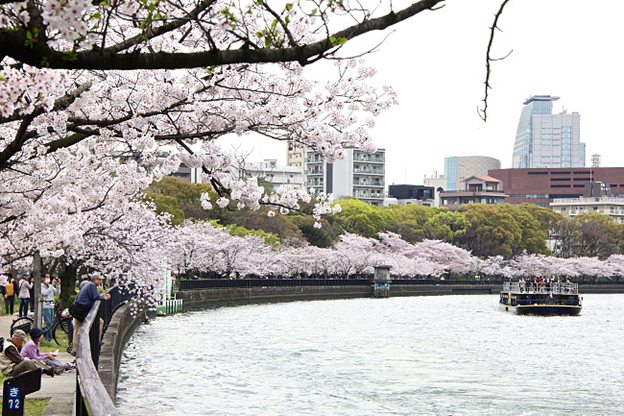 The best place of viewing sakura is the first stop of the park with 3,200 sakura trees. 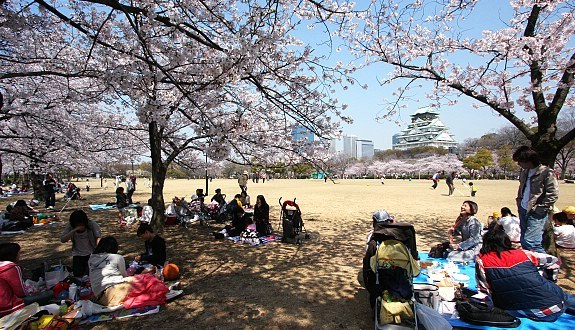 During spring season, the park is crowded for sakura hanami spot. All of the 10 best spots of viewing cherry blossoms listed above are a guide for the people plan to visit Kansai area during spring season. So, are you ready to enjoy hanami in this coming spring? Love from Sumi Ally C.
Asukayama Park is a public park, and is one of the major cherry blossom viewing spots in Tokyo.